As parents, a large part of helping your children pursue their dreams is preparing them for the rising cost of a post-secondary education. In 2018/2019, tuition in Canada rose by an average of 3.3 percent for undergraduate domestic students according to Statistics Canada. Canadian students can expect to pay an average of $6,838 per year for an undergraduate degree, and $7,086 per year for a graduate degree. That doesn’t include additional costs such as rent, books, food or monthly bills, which can add up to much more than the price of tuition. To cover these bills, many students will take out loans, which they end up paying off well after graduation. In today’s economy, the job market requires the advanced degrees and specialized skills that come from a post-secondary education. In fact, a 2016 study from the University of Ottawa’s Education Policy Research Initiative suggests that higher education is linked to higher salaries across the careers spectrum. By the year 2037, it could cost about $90,000 for tuition, which does not include room and board for a 4-year university program. That is in part why opening a Registered Education Savings Plan (RESP) is one of the most financially intelligent ways to save for your children’s future. As the distributor and investment manager of the Canadian Scholarship Trust Plans, CST Consultants Inc. focuses solely on education savings plans. It is through the distribution of RESPs that CST strives to fulfill their mission to enable all Canadian children to have the financial resources to pursue post-secondary education. CST has provided some helpful information to guide parents along the journey to saving for their child’s post-secondary education. First of all, if you’re a new parent and aren’t quite sure what an RESP is – a Registered Education Savings Plan is a tax-deferred post-secondary education savings plan where parents and family members can contribute to the RESP up to a lifetime limit of $50,000 per child. The investment income earned on your principal grows tax-free while it remains in the plan. This tax-deferred investment vehicle attracts government grants which also earn income. Payments from the plan are taxable in your child’s name, and since they are collecting these payments when they are students and tend to have little or no annual income, little or no tax is payable. With the cost of education rising every year, parents often find themselves asking whether they should be saving or borrowing for their child’s post-secondary education. With a few simple projections, the ideal choice becomes very clear. Not only does borrowing end up costing you more in the long run, it also puts the burden of debt on your child. 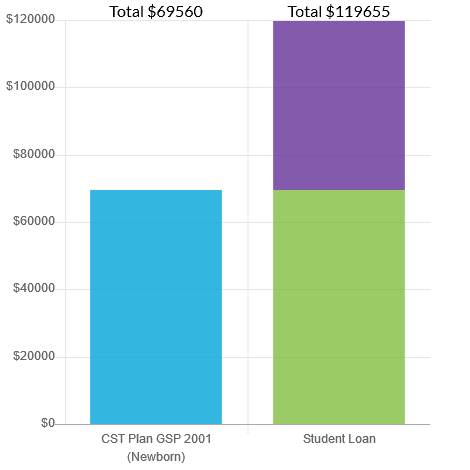 This illustration shows you how a contribution of just $210 a month for 17 years can result in considerable savings that reduce the need for a student loan. The earlier you start saving for your child’s post-secondary education, the more your savings will benefit in the long run. This graph illustrates the difference saving starting five years earlier makes in CST Group Savings Plan 2001. 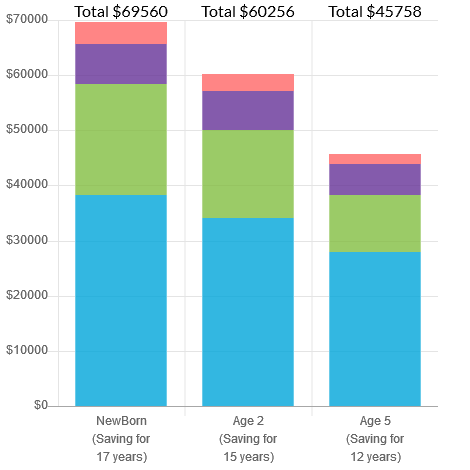 These projections are based on a contribution amount of $210 per month starting at different ages until the child turns 17. What types of post-secondary schools and programs qualify? The institutions range from community colleges and universities to vocational, technical, trade and religious schools, and new schools are being evaluated all the time. In addition, distance learning and correspondence courses are also eligible. Any program of three weeks or more in Canada is eligible. If your child is studying outside of Canada, any university program of three weeks or more is eligible; any other post-secondary program abroad must be 13 weeks or more to be eligible. How much do you need to invest if interested in a CST RESP? The minimum amount you need to invest in a Group Savings Plan 2001 RESP from CST Consultants is the greater of $9.50 per month or one-tenth of a unit. This low contribution level is one of the key advantages of CST’s GSP 2001. If you enroll in a Family Savings Plan or Individual Savings Plan, the minimum initial contribution is only $150. If your child is receiving the Canada Learning Bond, the minimum initial contribution for the Family Savings Plan and Individual Savings Plan will be waived. If you have questions about opening a CST RESP for your child or would like to get started, CST Sales Representatives are available to help you along your journey. We’ll send you a detailed statement of all the activity in your plan once a year. You can also view information about your account online any time by registering for secure access on the CST Self-Serve Website. You will have access to our customer experience department and, of course, your Sales Representative is always there to help you.